White paper on crime 2001 Part4/Chap.4/2. The number of foreign offenders newly received by public prosecutors offices for offenses except for professional negligence in traffic accidents and road traffic violations decreased to 21,318 in 2000, down by 1.2% from the previous year. By offense, visiting foreign nationals newly received by public prosecutors offices most frequently committed Immigration Control Law violations (44.3%), followed by larceny (22.1%), Stimulant Drug Control Law violations (4.6%) and bodily injury (4.4%) in that order. The percentages of larceny and bodily injury have been increasing in the last three years. By nationality, China had the largest shared percentage (42.1%), followed by South/North Korea (15.8%), the Philippines (6.1%), Iran (5.7%) and Brazil (5.5%), in that order. In 2000, 16,022 visiting foreign nationals were finally disposed by public prosecutors offices for offenses except for professional negligence in traffic accidents and road traffic violations, accounting for 4.2% of the total number of persons finally disposed by public prosecutors offices and for 75.4% of the total number of foreign nationals finally disposed. By type of offense, 7,082 foreign nationals were finally disposed for Immigrant Control Law violations, followed by 3,574 for larceny, 738 for bodily injury and 735 for Stimulant Drug Control Law violations. The rate of visiting foreign nationals to all foreign nationals finally disposed by public prosecutors was 96.4% for Immigrant Control Law violations, 90.3% for Cannabis Control Law violations, 78.9% for Anti-Prostitution Law violations, 78.7% for robbery, and 78.3% for forgery of various documents. The number of foreign nationals convicted by ordinary first instances of cases involving foreign nationals continued to rise since 1991, before reaching a peak in 1997 and going on a downward turn. However, the number went up again to 7,740,2.7 times larger than that of 1991, accounting for 9.9% of the number of all persons convicted by ordinary first instances. 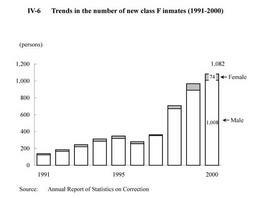 As for the correction of adults, the number of new Class F inmates (foreign nationals who are new inmates and need treatment programs different from those for Japanese inmates)rose sharply for the third year in a row in 2000, surpassing the 1,000 mark and reaching 1,082 inmates. By offense for new class F inmates, the percentage of larceny (34.2%) was the highest, followed by Immigrant Control Law violations (13.2%), Stimulant Drug Control Law violations (12.2%) and robbery (11.9%).